In which a grown man acts like a little kid. It's nice to see some real alternative titles get some mainstream attention at this year's E3. While Tim Schafer and Sesame Street might not necessarily be considered marginal or unconventional these days, they don't fit the usual mold of most high profile games. And whether it's motivated by childhood nostalgia or Double Fine's track record, it's gratifying to see the industry make a big deal out of a game aimed at four-year-olds. I played through a chapter of Once Upon a Monster at E3 today with the game's creator, Nathan Martz who is, by all outward appearances appears to be a grown-up. Double Fine's never worked on a licensed property before, but I was still somewhat surprised to find that the game began its life without any hint that it would one day be connected to Sesame Street. 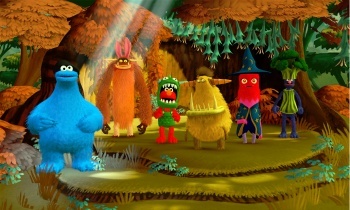 Martz originally wanted the storybook like game to be about different monsters who each had a problem you could solve. It was originally a sort of music game called "Happy Song," without any Kinect features at all. But when Double Fine pitched the idea to Warner and realized the company owned the rights to use the Sesame Street license, it seemed like the perfect fit. Sesame Street's "Whole Child Ciriculum," which stresses acceptance and education, dovetailed perfectly with the designers' own values, and the monster angle made it an easy transition. The game plays out in a magical storybook format in which kids and parents take on the roles of series' favorites Elmo and Cookie Monster and are encouraged to interact with other misunderstood monsters in order to replace fear with understanding. It's not a scary game by any stretch of the imagination, but the developers have been careful to strike a good balance in terms of the visuals and language of the game. In the chapter we played together, Nathan and I had to interact with the Gerrhoof, a large and lumbering monster hidden in the forest. We'd already seen the beginning of this sequence in the press conference earlier this week, so we moved past that to the point where the Gerrhoof has been cleaned up and made friends with the players. Even here, the adventure isn't over. The adorable little Puffalopes, who live in the forest aren't convinced the Gerrhoof still isn't dangerous, so the players have to lure them out of hiding by tossing biscuits out and petting the Puffalopes when they come out to eat. Having just written that description, where players tempt the cautious Puffalopes with sweets in order to make them come out where they can be petted and fondled, it may seem that there's the potential for a mixed message in the game, unintentional though it surely is. Nathan was quick to assure me that the game wants to strike a balance between helping kids learn to face their fears and prejudices without encouraging them to ignore their instincts for danger. Ultimately, this is a game meant to be played by a parent and a child, so the final responsibility lies with the parent. Eventually, the Puffalopes come around and take the player and the Gerrhoof off to Shangri-Luff where a good time is had by all. I asked Nathan if he felt pressure to add complexity or challenge to the game given all the other titles he's surrounded by at the Warner Bros. booth. His response was that traditional game design is built around failure, which doesn't work as a motivating factor in a game built for kids. That answer made me reassess some of my own assumptions about whether we're too narrowly defining the games which make up most of the market. Nevertheless, Once Upon a Monster will include some end-of-game unlocks for players who manage to play sections perfectly. I'll be playing this one when it comes out this fall.